You can get an iPad running the latest version of iOS, or you can get a fully working OS X tablet. The Modbook Pro, which is essentially a 13.3-inch MacBook Pro, is an actual existing product that's basically a converted mid-2012 model but in tablet form. Thanks to Modbook Inc., this is as close to the Surface for Windows 8 Pro as Apple fans will get. At least unofficially. 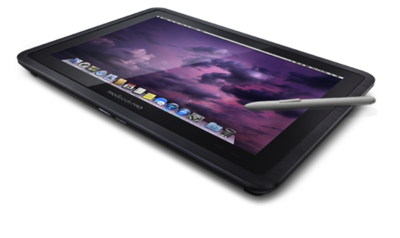 The thing is, though, is that the Modbook Pro doesn't come cheap—it essentially doubles your point of entry into the Apple ecosystem, so you really have to want an OS X tablet to justify ever buying one. The base model sports an Intel Core i5, dual-core, 2.5GHz chip and 8GB of RAM—you can upgrade that up to an i7, dual-core, 2.9GHz, and also double the RAM as well. The Modbook Pro keeps the same 1280 x 800 resolution display it's based off of, and still allows users to hook up to an external display through the device's Intel HD 4000 chipset. All the standard inputs and outputs are still present, though it forgoes one USB 3 port to include a Wacom display connection—the's even a DVD burning SuperDrive onboard. The device itself keeps in line with Apple's aluminum design, and weighs in at 5.4 pounds. The screen also features a Wacom pen tablet digitizer, with 1024 pen pressure levels and a recognition rate of 133 points per second and a recognition resolution of approximately 1/100th of a millimeter, according to Modbook's website. If you have the cash, the entry-level Modbook Pro starts at $3,499 with no upgrades whatsoever. The device, as one would expect, voids Apple's complimentary one-year warranty, but Modbook does offer its own one-year warranty in return. It's definitely a feat of engineering, there's no denying that. But something that needs to exist? Maybe not for $3,499.